Embracing my lifelong career in midwifery began not as a conscious intention, but rather, as Destiny. In 1976, I was a twenty-something back-to-the-land hippie in rural northern Michigan when I caught my first baby for a first-time mother. I was also pregnant with my own first child. I wasn't doing it for the money. I was doing it for "the movement" to take birth back. I figured I'd be catching babies long enough to help my girlfriends have their births the way they wanted them, and for me to have mine. After that, I'd move on to my "real job." Thirty-eight years later, it turns out catching babies was not only my real job, but moving midwifery forward in the United States was my real calling in life. For nearly four decades I have answered my calling fully and wholeheartedly. My midwifery journey has taken me to assorted destinations from community-based homebirth, to clinic-based healthcare for underserved populations, to co-founding a freestanding birth center with a team of DEMs and CNMs. I have caught babies at home, in birth centers and in hospitals. Even in sailboats and under apple trees. I have been educated through multiple pathways including self-taught lay midwifery, competency-based direct-entry midwifery (DEM), and university-based nurse-midwifery (CNM) with an accompanying Master's degree. Each pathway contributed to my expertise in a unique and valuable way. But my early homebirth roots—when our nurslings and toddlers accompanied us and stood wide-eyed and open-mouthed as they witnessed everyday miracles in the birth bed—laid the unflappable foundation for it all. 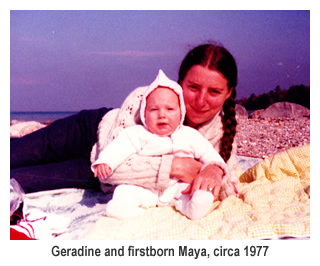 In the 1970s in my local neighborhood, I blazed a trail for a liberated and personalized way to give birth. In my state in the 1980s, I joined with likeminded peers to organize and co-found a vibrant professional midwifery organization that thrives to this day. In the mid-1990s, after specializing in normal physiological home birth for almost two decades, I went back to school and became a nurse-midwife so I could serve a broader range of women and their families. It has been a gift and a pleasure to work for two populations different from my own. First I served Hispanic migrant farmworkers who traveled from Texas, Mexico and Central America to harvest fruits and vegetables in Northern Michigan, and then, numerous Tribal communities in the Upper Midwest. It has been a privilege to learn about traditions, health practices, languages, and beliefs unlike mine. For it is only through being immersed in a culture distinctly different from one's own that we learn to think outside of our narrow lens on the world. It is then that the doors of true compassion and understanding can open wider. When I moved into the realm of national midwifery leadership, advocacy to affect U.S. maternity care policies, and international midwifery initiatives, I was able to bring the numerous lessons I'd learned from people, cultures and politics. I became fiercely dedicated to issues of access, equity and respect for women's self-determination and for their right to make decisions about their health and that of their unborn and newborn infants. 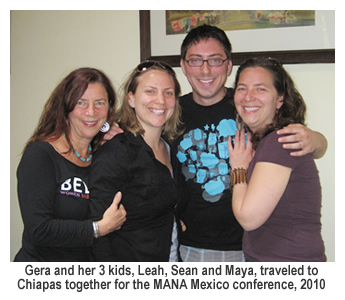 In the late 1990s I made a transition from MANA member-at-large to a member of the MANA leadership team. For more than 15 years I have been deeply embedded in that team, first in three different roles on the Board of Directors, including President for two terms, and more recently as MANA's first Executive Director. Throughout those years, it has been my pleasure and privilege to work with many talented, passionate, and dedicated people, very few of whom are paid, and most of whom volunteer their precious time and energy to MANA and the midwifery movement. Gratitude, gratitude to each of you. As I stand on the cusp of this transition, it is stunning how swiftly all of the years have flown by. During those times when I patiently waited for a breech baby to be born or feverishly worked to get a stuck baby out, the moments were inordinately slow. In fact, at those moments, time stood still. But earlier this month, as I worked amongst colleagues at the historic national meeting of the US MERA Work Group, it was odd to hear these words coming out of my mouth..."I am retiring." A voice inside me whispered, "Already, really?" But indeed, I am retiring. I heard my calling. I answered it with a lifetime of service. And now, I am entering into a period of rest and renewal. As many of you know, after more than 20 years of living as a single, self-employed midwife and mother of three kids, seven months ago I married Fred, my old friend and lover. And as many of you also know—life is short! I intend to jump deeply and fully into this new adventure. Fred has a sailboat, and who knows what destination you might be hearing from me next. A new and intriguing era for MANA has begun...and I wish you many blessings. May you be confident that MANA is in good hands with the next generation of leaders that are taking the helm and with the generation of Founding Mothers standing side-by-side to guide them. May you be generous in supporting the vision for the future articulated by your new and inspiring President, Marinah Farrell. May you be patient with the leadership team as MANA makes its next evolutionary leap into unchartered territory. And may you find a comfortable and welcoming home in MANA and a satisfying place just right for you to contribute your unique talents to the U.S. midwifery movement. I leave you all with my spirit-arms wrapped steadfastly around you in camaraderie. Thank you for the honor of serving you all these years, for the many extraordinary and memorable adventures, and for the love you have shown me. Good bye, Gera. I will miss you at conferences but maybe will sail by you in the Caribbean. Retirement is wonderful. If you come to NJ let us know. Sweet blessings to you. Reading your farewell, memories flooded through me. Thanks for your long and passionate service to MANA. I love hearing that you are going sailing....the coast of Maine, what do you think? You and Fred are invited to sail into harbor on the Downeast Maine Coast for some good food, good conversation, beautiful hikes and a comfortable bed. We'd love to see you! It has been a true privilege to work along side you. Your vision and energy have always been inspiring to me whether attending a woman during labor and birth or working on MANA projects. It is so exciting to see you enter this next phase of your life. 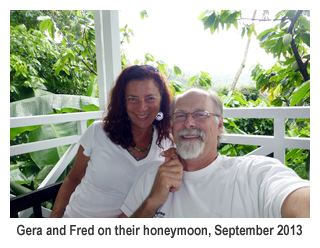 After decades of caring service, a loving partner AND a sailboat, how can life get better? I can hardly wait to see! While you will be missed by all of us, I am thrilled that you are making space in your life to be with the man you love. Life is short, and while we love midwifery, our partners and family must always be first in our lives. How beautiful that you and Fred will be able to spend this time together! You deserve it! I wish you safe travels. Thank you for blessing midwifery with your devotion, energy, and love. We'll all miss you!!! I remember when we met in the early days of formation of the Michigan Midwives Association. Your baby had on the cutest little pants with the footie build right in! In many ways you helped guide me personally, and the MMA (and then MANA) through the early years of professionalizing birth midwifery - lessons I am now taking into the death midwifery realm. Thank you for all your years of dedication to your heart's calling and your devoted service to women, babies and families. Have a wonderful time sailing! If you ever need crew, lemme know! Thank you Gera for your service to mothers, fathers, wee ones and normal birth, thank you! Congratulations Geraldine, Wishing you Peace, Joy and Abundance on your new journey in life. I appreciated getting to know you through the MANA Strategic Planning process at The Farm in Tennessee. At this meeting you led the group to have a space for honest discussion on the Social Justice in midwifery movement, which led to this being a part of the MANA Strategic Plan. Thank you for all your contributions for a better world. We will miss you, Gera! Gera, it's hard to believe you are actually retiring! You've been involved with MANA for so long and accomplished so much during your tenure. It wont be the same without you! Thank you so much for all you have given to midwifery, to MANA, and to me! 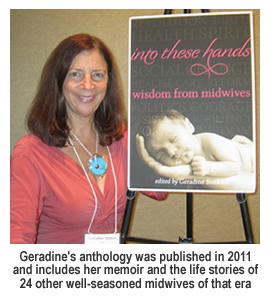 Thank you Geraldine for your service to mamas, babies, midwives, movement and motherhood. You are amazing! Please enjoy your upcoming adventures! My deepest, most sincere gratitude for a dear, dear friend!! Gera!!! Congratulations and best wishes on your retirement, Dear One! Working with you and becoming dear friends has been one of the most wonderful things about working in this amazing midwifery community. Your commitment, wisdom, steadfast focus, open heart and compassion have been such an inspiration to all of us. Your contributions to the movement have been huge, and you have enriched all of our lives. I - and we - will miss you so much. But maybe this means you'll have time to come out East for a visit!! Thank you, Gera. Your work for midwifery is greatly appreciated. Wishing you great joy in your future endeavors. I loved what you wrote; it made me cry. Your journey as a midwife is amazing and awe-inspiring. I think of all the children you helped into the world, all the mothers you guided, all the dads you comforted. You are an incredible blessing to the World. May the next stage of your life bring you happiness and fulfillment. I cherish our friendship. I love it that I am just young enough in midwife years to be catching a few babies of your babies~and old enough chronologically to know you as a friend, neighbor, sister midwife, activist, wise woman,dancer, leader, event planner and so much more! Gera, you've meant so much to SO many of us, especially your "home town girls"of Michigan. We need to meet soon. I'll bring the list. You order our wine if you get there before me. And we'll plan one more event together~your retirement party. It will be Gera style with all the stops pulled! Gera, you have made such a difference to MANA and in the other realms of your life. I am thankful I got to work beside you for a few busy, exciting, frustrating, amazing years. I have to say, I can think of many adjectives that describe your wonderful presence, but so far "retiring" has certainly not been one of them! Wow! You are amazing! It has been wonderful getting to know you during your midwifery years. I admire you, and thank you for all your contributions to midwifery and the women & families we serve. Enjoy your retirement and I look forward to our paths crossing again. Wow! Double wow! And triple wow! You have been a spectacular presence for so many of us. Your footprints are huge, your shoulders are beyond belief. You have boosted and booted so many of us further along our paths. May your days and years of breathing and sleeping more deeply fill you full. You have unbelievable numbers of grateful friends watching you sail along into your new journey. Now you walk in beauty -- beauty is before you, beauty is behind you, beauty is above you, beauty is below you. You are beauty. Thank you for the lifetime of service you have given to birthing women and to all of Midwifery. I only know of you through your work with MANA, and have only seen you at MANA conferences. But every time you spoke or gave an address I sat up, leaned forward, and paid attention to what you had to say. What you said moved me deeply, and I went back to my own practice with a broader sense of purpose and understanding of Midwifery in the world, which had a way of clarifying the calling in my heart. Thank you, Gera, and happy retirement! Its been an honor to have gotten to work with you over the last decade. Thank you so much for all you have done for midwifery. I also want to thank you for your support of consumers and consumer participation in the midwifery movement. Your support has been greatly appreciated. I love thinking of you sailing into the sunset with Fred. I wish you all the very best life can offer. Enjoy your retirement.